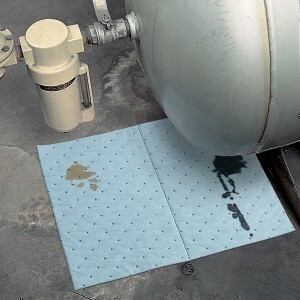 FineFiber Oil-Only Mat is naturally water-resistant (hydrophobic). A random assembly of large-diameter MeltBlown poly fibers creates a lofty inner layer that absorbs high volumes of oil — but not water — fast. Low-profile sorbent can be used wherever you need to catch oil leaks, spills or overspray. HeavyWeight construction offers the greatest sorbency. Pads are perfed at 7.5" vertically. Tear off only what you need — save money! Color-coding helps you visually identify the right sorbent for your needs. Blue designates Oil-Only sorbency and fits into many professional surroundings.